Hello, today we’re going to be looking at 10 of the most popular Hamilton Khaki watches for men. These are mid-range to high-end Swiss made timepieces from a popular brand. Are Hamilton watches good? In my opinion I think Hamilton watches are a good brand. They build a variety of Swiss made watches in a selection of styles and designs. 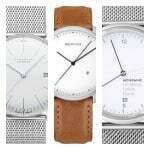 In this list we’re specifically looking at the Hamilton Khaki range, but if you like the look of this brand I’d also recommend the Hamilton Jazzmaster watches. If you have any questions about any of the Hamilton Khaki watches featured in today’s list just comment below and I’ll get back to you as soon as I can. For now, enjoy the list. First up on our list of the best Hamilton Khaki watches is this popular 38mm Khaki Field automatic. This Swiss made Hamilton watch is made with a stainless steel 38mm casing that has a thickness of 11mm. The strap of the watch is made of a soft genuine leather with white stitching, it fastens with a buckle style clasp. This Hamilton Khaki automatic is powered by a Swiss made ETA 2824 automatic movement that’s powered by movement. You can view this Hamilton automatic movement at work through the exhibition caseback on the rear of the watch. This Hamilton Khaki field automatic also features a sapphire crystal glass for excellent scratch protectiong as well as a 100m water resistance rating. You can read my full Hamilton khaki field automatic 38mm review here soon. The Hamilton Khaki Field 42mm is the larger brother of the previous watch. It’s a Swiss made watch that’s built with a stainless steel casing that has a 42mm diameter and a thickness of 12mm. The strap that’s been paired with it is made of a soft genuine leather and fastens with a buckle style clasp. 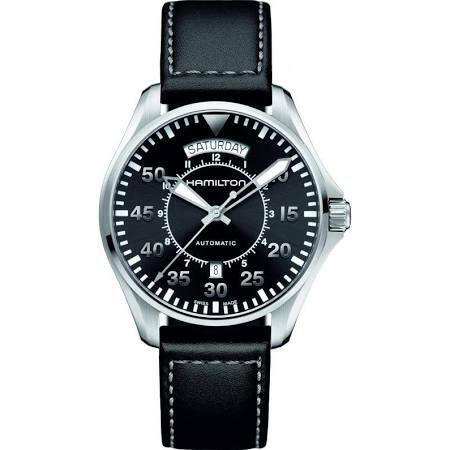 This Hamilton Field watch is powered by a Swiss automatic movement ETA 2824-2 calibre. You can actually see the movement working away through the rear of the watch with its exhibition style caseback. 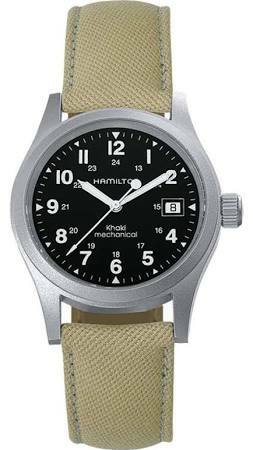 Other features of this Hamilton Khaki Field 42mm include a sapphire crystal glass for excellent scratch reisstance. It also has a 100m water resistance rating which is great to see. You can read my full H70555533 Hamilton Khaki field review here soon. This popular day date watch is the Hamilton Khaki King. It’s a Swiss made watch that features a 40mm stainless steel casing with a 12mm thickness. The strap of this Hamilton Khaki watch is made from a soft genuine leather for extra comfort and fastens with a buckle style clasp. The Hamilton Khaki King is powered by a Swiss made automatic movement that’s powered by the movement of your wrist. You can also view the movement of this Hamilton Khaki automatic through the exhibition caseback on the rear of the watch. This Hamilton Khaki watch also features a sapphire crystal glass for brilliant scratch resistance as well as a 50m water resistance rating. You can read my full H64455533 Hamilton watches review here soon. 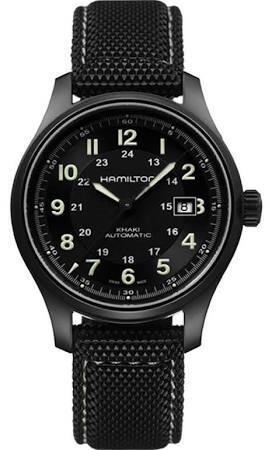 Here we have another high visibility Hamilton Khaki Field watch, this time in a black high contrasting design. 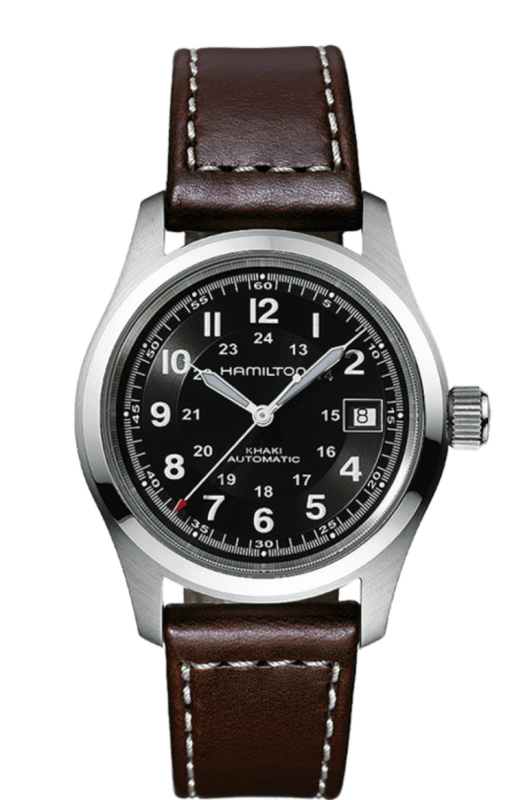 The Swiss made Hamilton Khaki is built with a stainless steel 38mm casing and has a thickness of 11mm. The strap is made of a soft genuine leather strap and fastens with a buckle style clasp, it also has white stitching that looks quite nice. This watch is powered by a high end Swiss automatic movement which is often desired in high end watches.You can view this Hamilton Khaki automatic movement working away through the rear exhibition caseback of the watch. 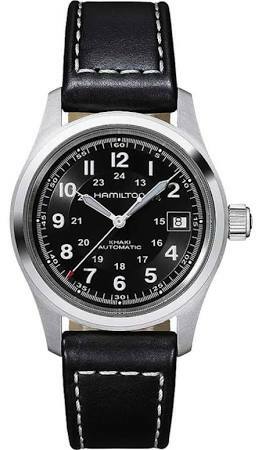 Extra features of this Hamilton Khaki field watch include a sapphire crystal glass for a high level of scratch resistance. It also has a 100m water resistance rating which is great to see. You can read my full H70455733 Hamilton Khaki Field automatic 38mm review here soon. This Hamilton automatic scuba style watch is made with a 41mm stainless steel casing that has a thickness of 14mm making it a slightly chunky watch. The strap of this Hamilton Khaki watch is also made of stainless steel and fastens with a push deployment fold over clasp. The dial features a high visibility display with white lume filled hands and a day and date display. Housed inside this Hamilton watch is a Swiss made ETA 2834-2 automatic movement. These are popular as they don’t require a battery and charge themselves up from movement. You can view this movement through the rear exhibition caseback on the watch. Other features include a rotating coin edged bezel as well as a sapphire crystal glass for excellent scratch resistance, and a 100m water resistance rating. You can view my full H64515133 Hamilton Khaki mechanical review here soon. 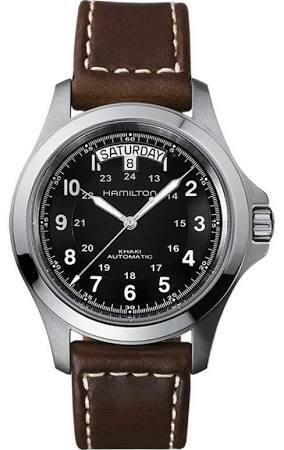 Up next we have a Hamilton Khaki pilot automatic Swiss made watch. This model is built with a stainless steel 42mm casing and has a thickness of 12mm. The strap is also made of stainless steel and fastens with a push deployment fold over style clasp. The dial features easy to read high contrasting bold lume filled hands that really stand out. There’s a day display at the 12 o’clock position and a date display at the 6 o’clock position. Powering this Hamilton Khaki watch is a Swiss made 25 jewel automatic 2834-2 movement. This automatic movement can be seen through the exhibition caseback on the watch. 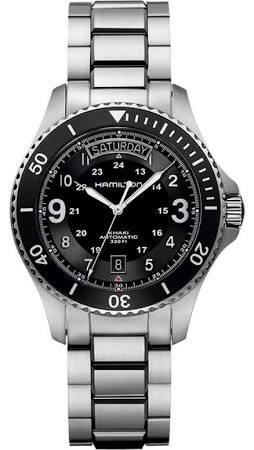 Extra features of this Hamilton Khaki pilot watch include a sapphire crystal glass and a 100m water resistance rating. You can read my full H64615135 Hamilton khaki field review here soon. Up next we have a Hamilton khaki Mechanical watch that’s built with a 38mm stainless steel casing with a slim 10mm depth. The strap is made of a durable and comfortable fabric that fastens with a secure buckle style clasp. The dial has a high visibility display with high contrasting hands and numeral style hour markers. There’s also a useful date display found at the 3 o’clock position. Powering this Hamilton Khaki watch is a mechanical hand wound movement that beats at 28,800 vibrations per hour with 17 jewels. This is a Swiss 2804-2 calibre movement. This Hamilton Khaki watch also has a sapphire crystal glass for a very high level of scratch resistance and has a 50m water resistance rating. You can read my full H69419933 Hamilton Khaki mechanical review here soon. 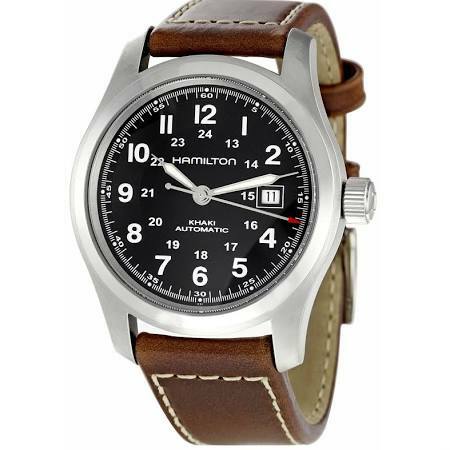 In at number 8 we have this impressive looking Hamilton Khaki pilot style watch. It’s constructed with a 42mm stainless steel casing that has a 10mm thickness. It’s been paired up with a soft genuine leather strap that fastens with a buckle style clasp. As you’d expect from any decent pilot style watch this model has a high visibility display with lume coated the bold style hands. There’s also a day and date display which is popular for Swiss made watches. 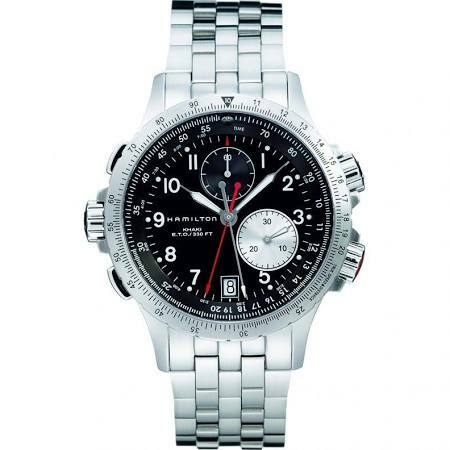 This Hamilton Khaki automatic watch is powered by a Swiss made ETA 2834-2 automatic movement. You can see this movement working away through the exhibition caseback. 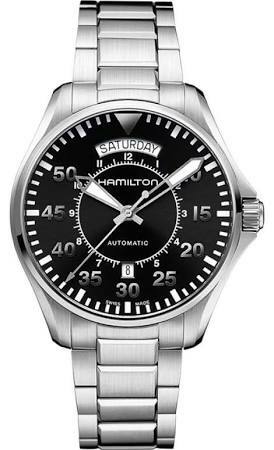 Extra features of this Hamilton Khaki 42mm watch include a sapphire crystal glass and a 100m water resistance rating. You can read my full H64615735 Hamilton Khaki review here soon. This men’s Hamilton Khaki automatic titanium watch is built with a black ion plated titanium casing that measures 42mm in diameter with a thickness of 12mm. 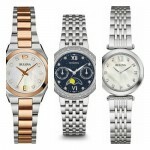 Titanium watches are popular due to them being lighter and stronger than traditional stainless steel. The strap is made with a soft comfortable fabric and fastens with a double prong buckle style clasp. The dial of this Hamilton Khaki titanium watch features small numeral style hour markers and slim lume filled hands. There’s also a small useful date display at the 3 o’clock position. Powering this Hamilton titanium watch is a Swiss made automatic movement for reliable and accurate timekeeping. You can see this Swiss movement working away through the exhibition caseback of this Hamilton khaki watch. Extra features include a lightweight build, sapphire crystal glass for excellent scratch protection, and a 100m water resistance rating. You can read my full H70575733 Hamilton Khaki field titanim review here soon. This Hamilton Khaki quartz chronograph watch is the last Swiss made timepiece to make it onto today’s list. This large Hamilton khaki watch is built with a stainless steel 42mm casing with a thickness of 13mm. The strap is also made of a stainless steel with a wide 20mm design. It fastens with a push button deployment fold over clasp. This Hamilton khaki watch features a large chronograph display with high contrasting white numeral hour markers and lume filled hands. There’s a small date display located at the 6 o’clock position on the dial too. Powering this Hamilton Khaki quartz watch is a Swiss made calibre 251.292 reliable quartz movement. Protecting the dial is a sapphire crystal glass for excellent scratch resistance. Last but not least the watch features a 100m water resistance rating. You can read my full H77612133 Hamilton khaki review here soon. Thanks for taking the time to read through today’s list of the best Hamilton Khaki watches for men. With any luck you’ve found a little inspiration for what you want from your next timepiece. 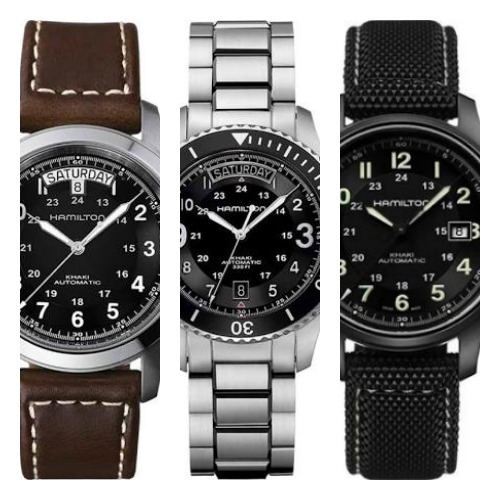 What was your favourite Hamilton Khaki watch featured in today’s list? Comment below and let me know.